CLEARANCE Green Sea Sediment Jasper Chips - avg 4mm x 14mm x 6mm with avg 80+ beads per strand - Hole : ~0.8mm - Style / Shape : Freeform Chips - Treatment : Dyed - Sold by Strand - must take last 2. Sea Sediment Jasper Beads | Impression Jasper Beads - African Impression Jasper and Sea Sediment Jasper are only two of the names for this gorgeous gemstone that is also referred to as : 'Aqua Terra Jasper' (the blue & green colors), 'Impression Jasper' (for it does make quite the impression), as well as 'Regalite' (for it is quite 'regal' looking! 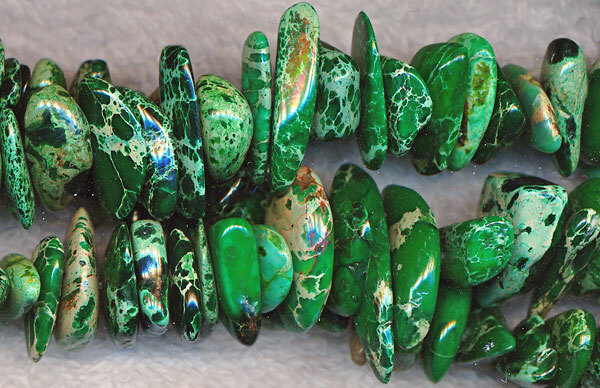 ), Spider Web Jasper and Variscite. This stone has proven to be somewhat of a mystery. We know that it is a dyed and color-stabilized jasper material from Africa -- but no one in the market knows what exactly to call it! Jasper was a favorite gem in ancient times and is referenced in Hebrew, Assyrian and Latin literature. It is a fine-grained chalcedony. The name jasper comes from the Greek and means 'spotted stone'. If you wish, this gemstone can be Faceted by a skilled napper.